("help with the cow program")...This program is very very important. If you can help to organize our cow program in Mayapur, it will be a great credit for you. Cow protection is the business of the vaisyas and along with our preaching, this is the most important work. We must have a good section of Brahmanas in our society and we must also have a good group of vaisyas who can grow grains and tend cows, and thus supply the society with food-grains and milk products from the cow like ghee, curd, cream, etc. ...........and try to establish a very high cow-protection standard. We are giving cow protection in the very place where they are eaten. The cow is so wonderful and valuable in society. But you should also use the bulls by engaging them in tilling the ground. 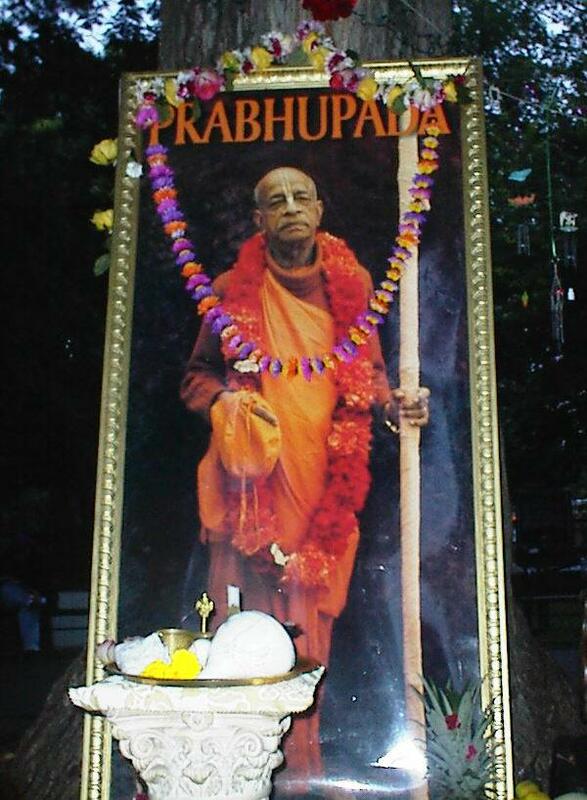 MEMO TO ALL DEVOTEES Prabhupada has requested that 7 temples be established there. Its main activity will be cow protection and to show the world that simply by living with cows and land and chanting HARE KRISHNA a perfect society will prevail. Therefore I am asking so much here and..., "Farm, farm, farm, farm..." That is not my program--Krsna's program. Annad bhavanti bhutani. Produce greenness everywhere, everywhere. Vrndavana. It is not this motorcar civilization. "Life and Milk of Cow" is all-important to the Swamiji's way of life; all else is artificial, he claims. The Lord is specifically the protector of the cows and the brahmanas, and hence He enhances the prosperity of the world. Maharaja Pariksit was actually an ideal saintly king because while touring his kingdom he happened to see that a poor cow was about to be killed by the personified Kali, whom he at once took to task as a murderer. According to scriptures also, there are seven mothers: (1) the real mother, (2) the wife of the spiritual master, (3) the wife of a brahmana, (4) the wife of the king, (5) the cow, (6) the nurse, and (7) the earth. All of them are mothers. The Lord Govinda is engaged there in herding the surabhi cows as His natural occupation. Dvaraka was surrounded by flower gardens and fruit orchards along with reservoirs of water and growing lotuses. There is no mention of mills and factories supported by slaughterhouses, which are the necessary paraphernalia of the modern metropolis. The city of Dvarakapuri was filled with the opulences of all seasons. There were hermitages, orchards, flower gardens, parks and reservoirs of water breeding lotus flowers all over. Has this civilization enhanced the cause of equality and fraternity by sending thousands of men into a hellish factory and the war fields at the whims of a particular man?